Hi, friend! I hope you have a cup of coffee or your fave fall beverage and are ready to see my home. If you’ve landed here from Life Love Larson, welcome! I adore Andrea’s chic style and our mutual love of cider donuts. A bit of a back story before we dive in- we moved into our home about a year ago, so I didn’t really get to decorate for fall last year. This makes it all the more fun to share our fall home tour this year thanks to Marty from A Stroll Thru Life and her amazing tours. 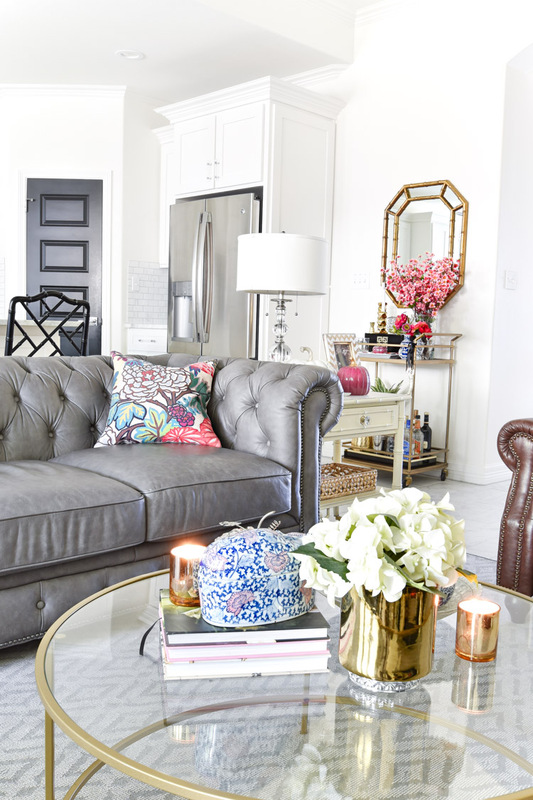 It’s so fun to see homes from all different types of styles and regions from such talented bloggers. I’ll link up the other homes participating in the tour at the bottom of my post. Affiliate links are used in this post- thanks for your support! So…Pee Wee wanted to say hi! He’s my little sidekick during photo shoots and can often be found getting more dog hair in places I just vacuumed. I’m ok with that since he’s so cute. My sweet boy just turned 13, and I couldn’t love him any more. He’s everything to me. Let’s start in the foyer! 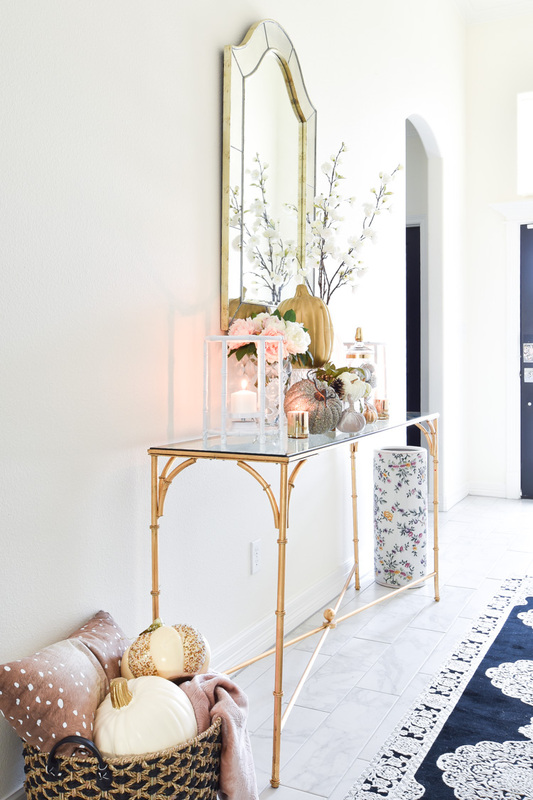 I really love super girly pinks and florals, so I indulged in that love in the foyer. I love how the warm candlelight illuminates the creamy whites and golds, and the punch of pink is subtle and feminine. This area gets a lot of natural light, but as the sun goes down the area gets a bit more moody. Love. I always feel textures are a must in a space with a lot of white to add contrast/depth, and you can see I have plenty of metallic mixed with natural elements, velvet, glitter and even some wood. 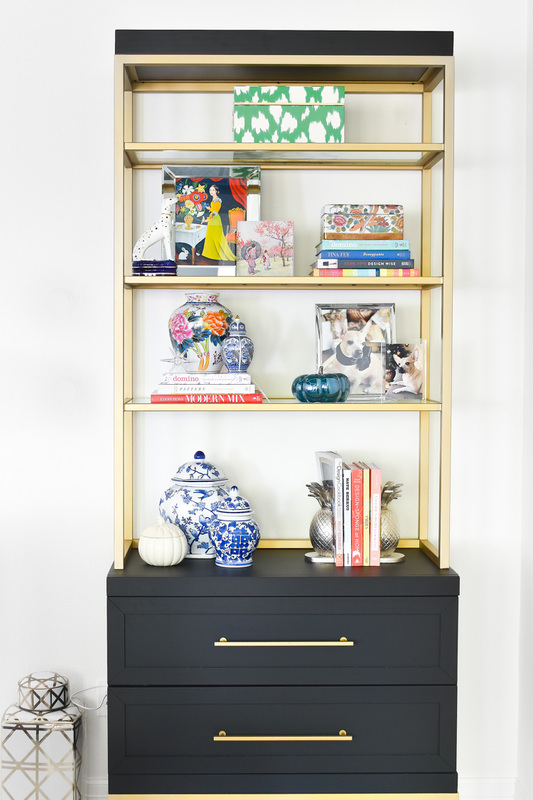 My foyer table is one of my fave pieces of furniture because while it is wide, it really isn’t visually heavy. 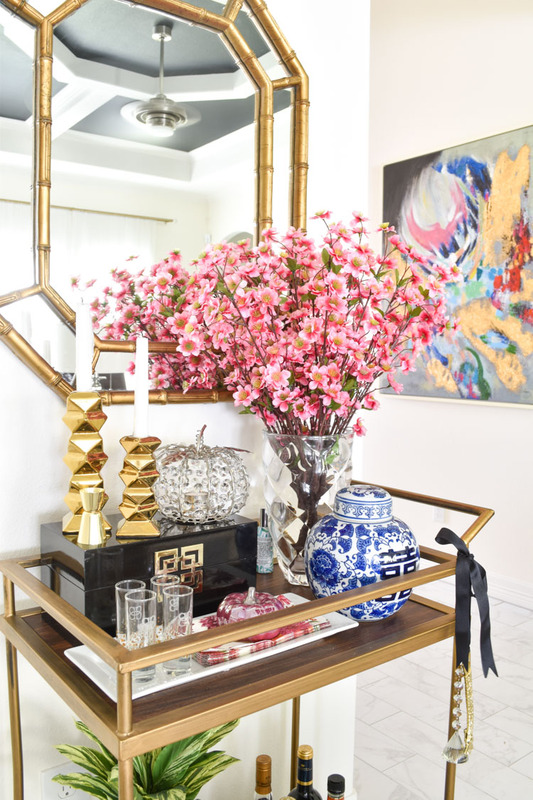 We I love chinoiserie style décor, so the bamboo touches on the base of the console table really accent and complement our other bamboo finishes in our home. And a final photo of the foyer before we rendezvous in the living room, which has been a work in progress for the last year. Sadly, the emerald green velvet curtains I ordered for the living room didn’t come in on time for the shoot, so the photos are going to look a little more sparse than they should. Luckily, you will get to see the emerald curtains in the dining room, which is coming up a bit later in the tour. 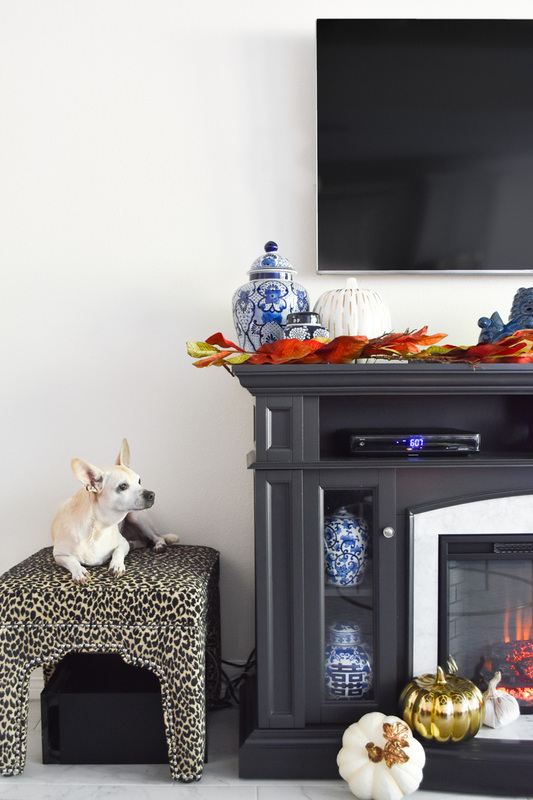 Recently, we had a huge debacle with buying a TV stand. Our first, second and third choices all fell through, and on a lucky Monday, I found a beautiful fireplace TV stand at Lowe’s for $125. I bought it, and here she is in our home. I love the dark gray color against the white walls, plus it works with our black tray ceilings. 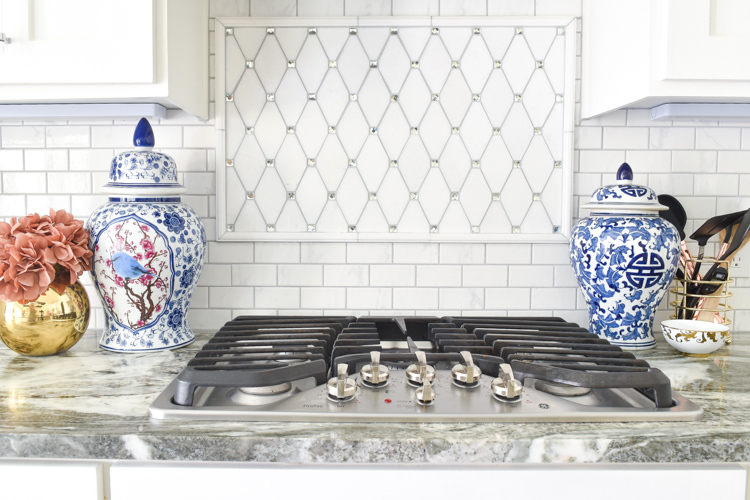 The marble accent around the firebox fits right in with our countertops and flooring. 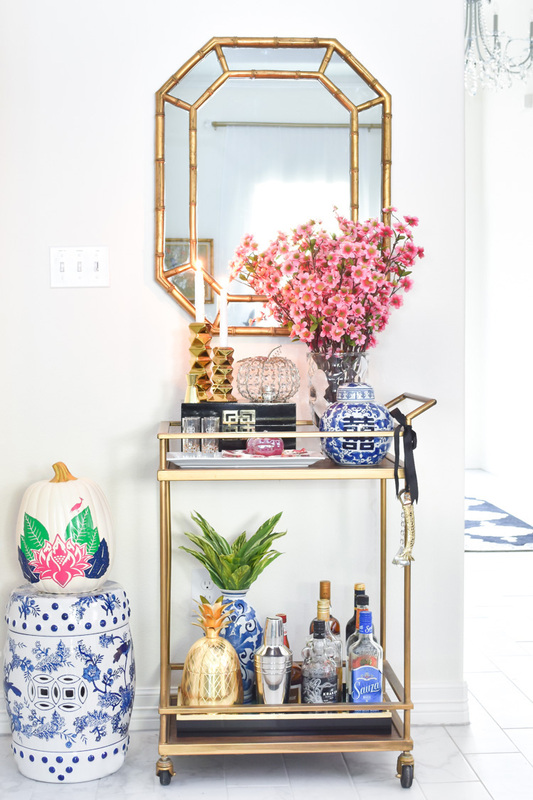 If you’re familiar with my blog, you all know I’m majorly crushing on all things ginger jars, chinoiserie and bamboo, so I tried to fit as many ginger jars on this bad boy as I could. We recently purchased some leopard ottomans, so for now they’re flanking the sides of the fireplace. Behind all those ginger jars in the bottom portion are various TV/media components. I love that they can be hidden from view and still be useful. I’m on the prowl for some large scale art to fill up all the white space around the fireplace, but I’m waiting to find just the right pieces! And yes, that is my sound system subwoofer hidden under the stool, because priorities. But, there are bigger problems, and it’ll be fun to build my collection again. I sprinkled a few of the ones I did find on the etagere below. This is one of my fave pieces to curate seasonally. It allows me to display lots of stuff in an eclectic, yet cohesive way. 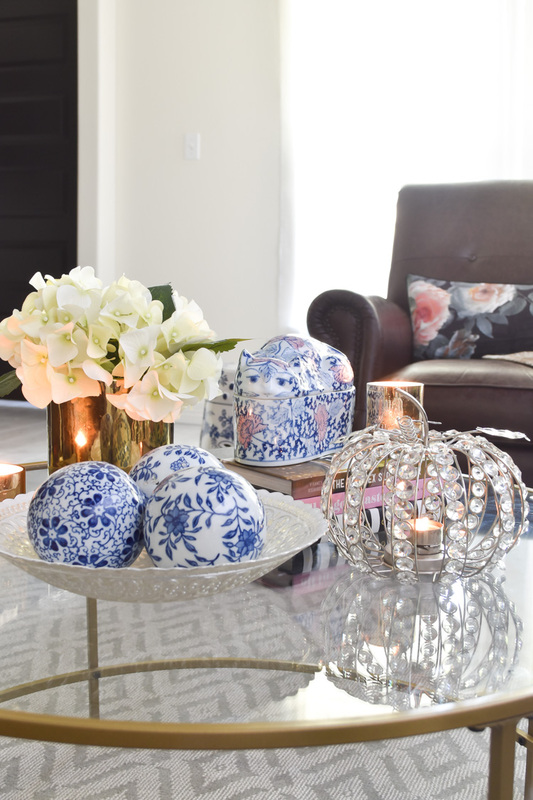 On the coffee table, I kept the décor simple. Some blue and white touches, books, flowers and pumpkins. Overall, I didn’t want to take away from the fireplace. I adore the cat box that is on the coffee table. True story, I thought the thing was heinous at the antique store I found it in, but once I brought him home (for a mere $5), he grew on me. Plus he holds remotes well for photo shoots. Thank you, cat box. And the end tables, which I recently added 2″ of height to to make them more functional/tall, also got some fall touches. Once the curtains arrive and get put up, this space will have a lot more color. I don’t usually gravitate towards green, but something about it lately has me crushing on it hard. And to the opposite side we have the view towards the foyer and bar cart nook. At least that’s what I call it anyway. I recently swapped out the smaller round mirror that was there (and is in the dining room, which you’ll see in a bit) for this bamboo estate sale find. I’ve had some decent luck at estate sales this year. I guess no one in my area likes chinoiserie as much as I do. 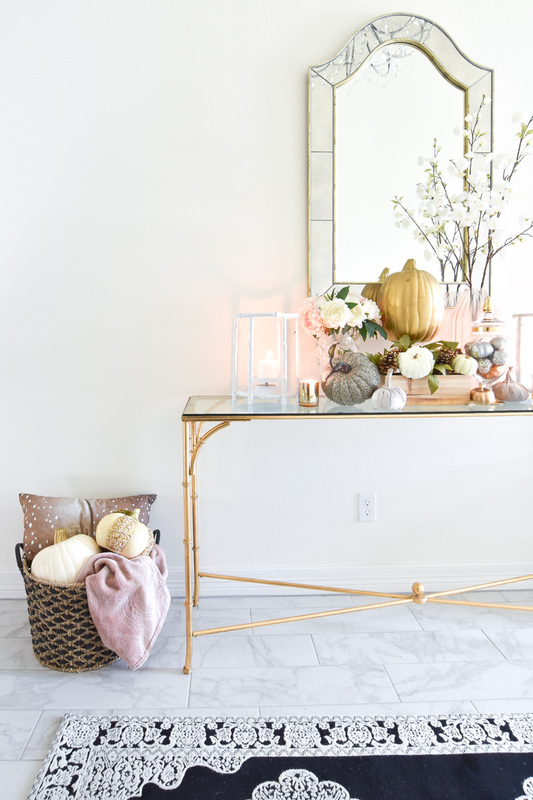 I kept the bar cart décor very simple for fall. I added two pumpkins, dusted off all the booze, and swapped a few accessories. As much as I love home decor, I’m not a maximalist by any means, so I keep it simple sometimes. I found a stunning piece of art at HomeGoods recently, and we placed it on a wall in the foyer. I kinda dig that you can see it from nearly any place in the living areas. It’s a HUGE statement piece. It’s 40×50 and has so much gold perfection. More about that next week! This is the first time I’ve ever had an open concept home that wasn’t an apartment, so having three living spaces converge in one big room means I have to keep decor in balance. This means I try to keep my kitchen counters cleared off and minimal while still adding in a bit of style. My biggest ginger jars looked way too large on the fireplace, so flanking the stove was the next best place for them. I always feel like blue and white make a place look clean and crisp. 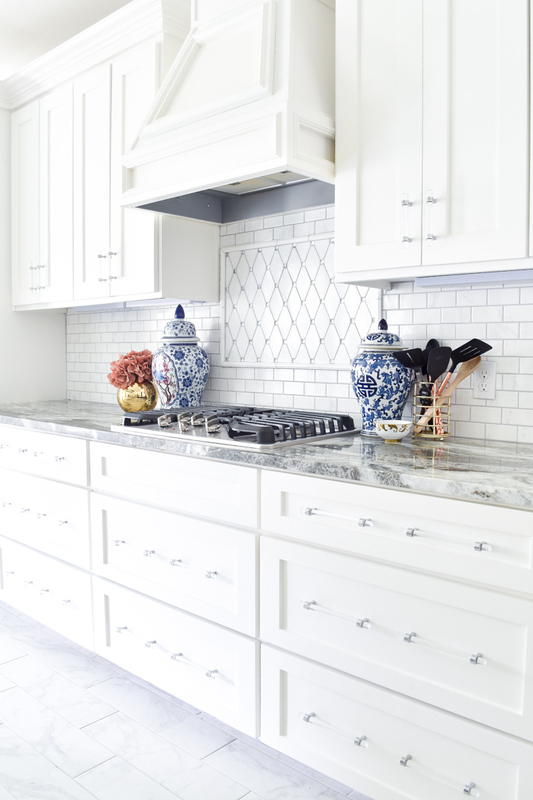 The blue and white also helps set off my amazing backsplash accent tile. 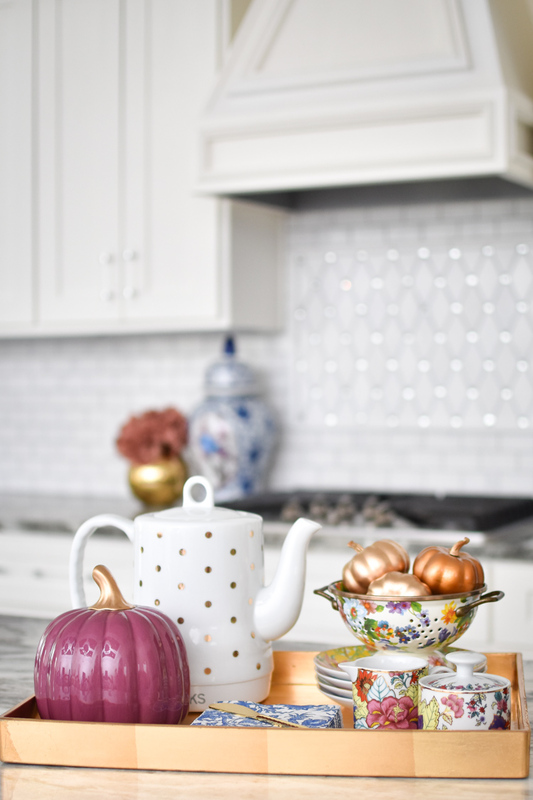 I admire my backsplash daily- I’m so glad I splurged on this inset. I’ve also recently started drinking tea as a way to destress in the evenings, so this tea tray set-up comes in handy. I was shocked at how fast a tea kettle can boil water- it takes 1-2 minutes, tops. On the stove I could go jog a mile and it’d still be at a slight simmer. I guess calling this space a dining room would be a bit of a stretch since it’s about 10×10 feet, but I packed a ton of style and color into this small space. 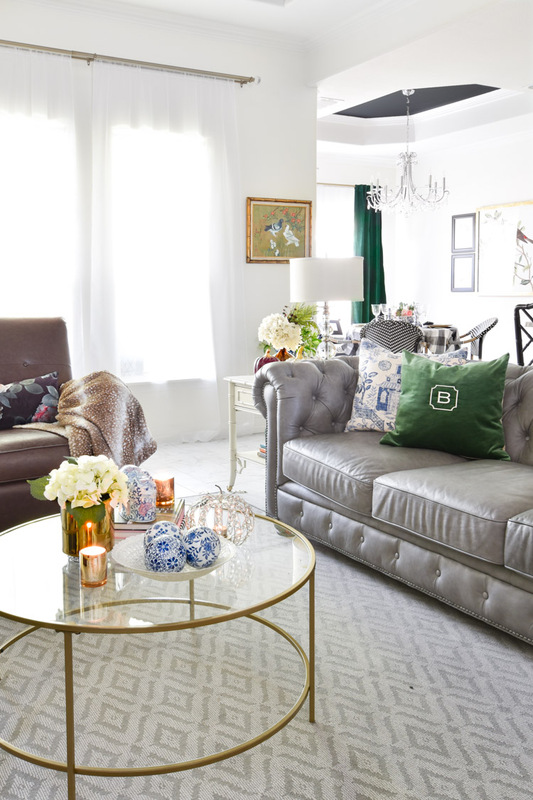 The addition of the green velvet curtains really transformed this whole space to a new level of luxe. For the tablecloth, I took an old rectangular tablecloth I had, folded it in half, and used it on my round table. 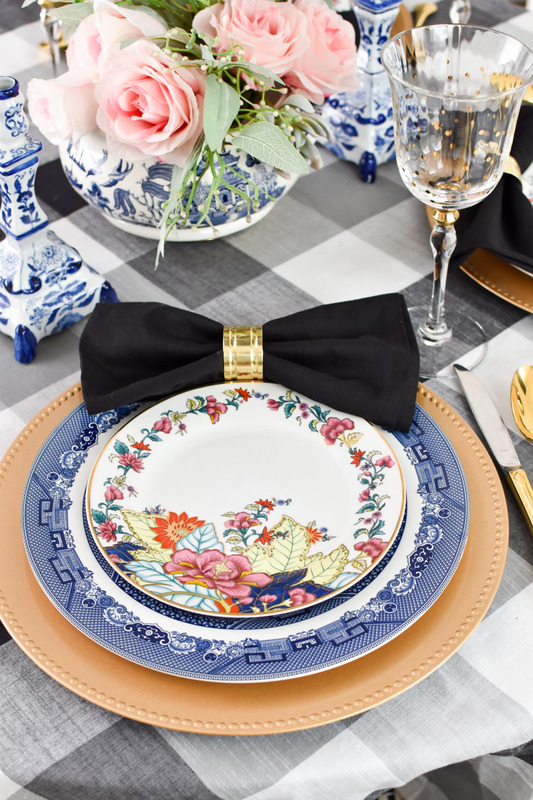 For each place setting, I used some of my imperial leaf china (tobacco leaf), blue and white chinoiserie dinner plates and gold chargers from Dollar Tree. Some recent antique hunting finds such as the soup tureen and blue and white candlesticks are at the center of the table. There’s a lot going on for such a small dining table, so I wanted the decor to be low and cohesive. This is probably one of my fave dining tables I’ve set ever, and I’ve set many. 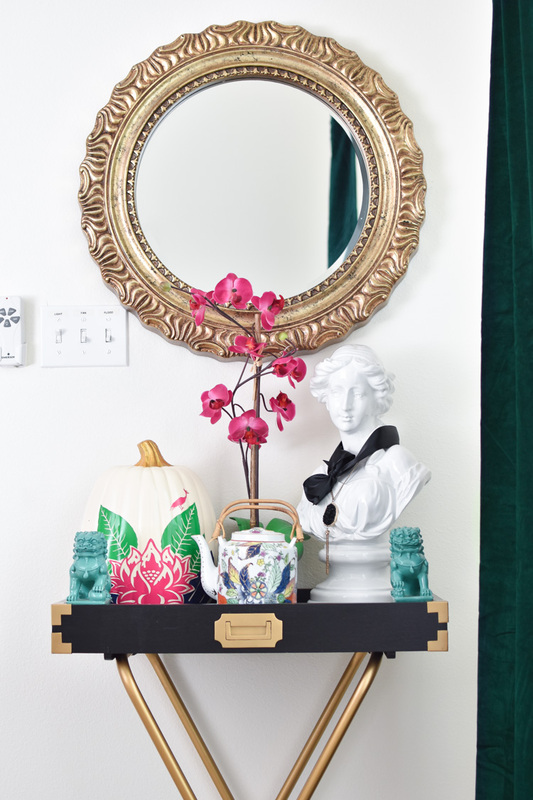 It has an everyday glamour to it, and every piece has been curated from my antique and thrifting adventures. I added a bench we had in our guest room in front of the window to add a bit more seating. It’s a fun bonus that I also get to add in more pillows and decor this way. The Chiang Mai Dragon fabric is one of my faves, and someday I hope to own an upholstered furniture piece in this fun fabric. The butler tray/stand got moved to this little wall to the right of the patio door, and this is where the mirror that was originally above the bar cart ended up. The tobacco leaf pumpkin seen above is an easy fall DIY decor project that I wrote a tutorial about last week. I even include most of the files (FOR FREE) that you’ll need to create your very own towards the bottom of that post for those of you who have a Cricut or Silhouette. 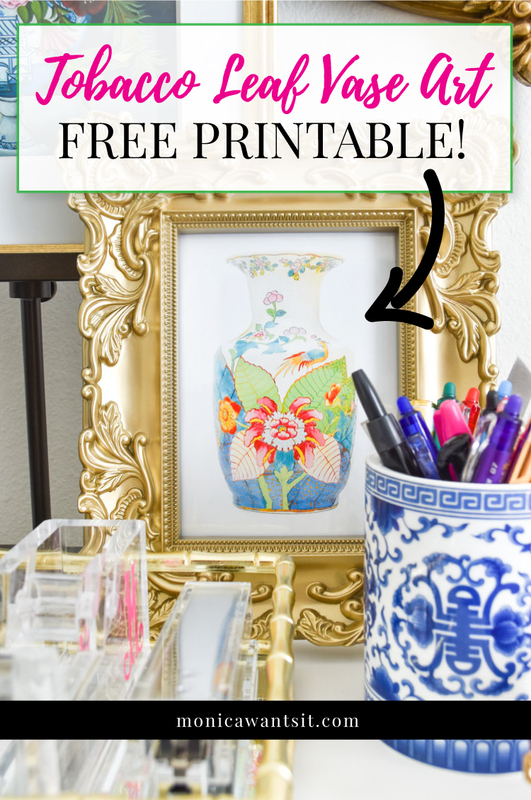 And if you love tobacco leaf china/decor as much as I do, I also have a free 5×7 printable available that’ll look simply amazing in a frame in your home. The blue and white hand painted ginger jar inspired pumpkin you see below will be on the blog on Monday if you want to come back and see the DIY tutorial. And that wraps up my fall home tour! 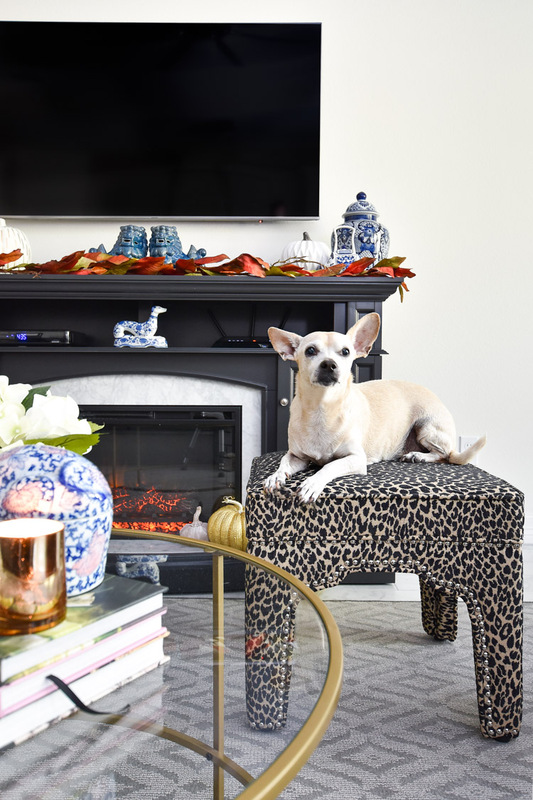 I hope you’ve loved seeing my home and hopefully learning a little about my decor style. If you’re new to my blog, I hope you’ll consider subscribing. I am now sending you off to see the beautiful home of Haneen from Haneen’s Haven! 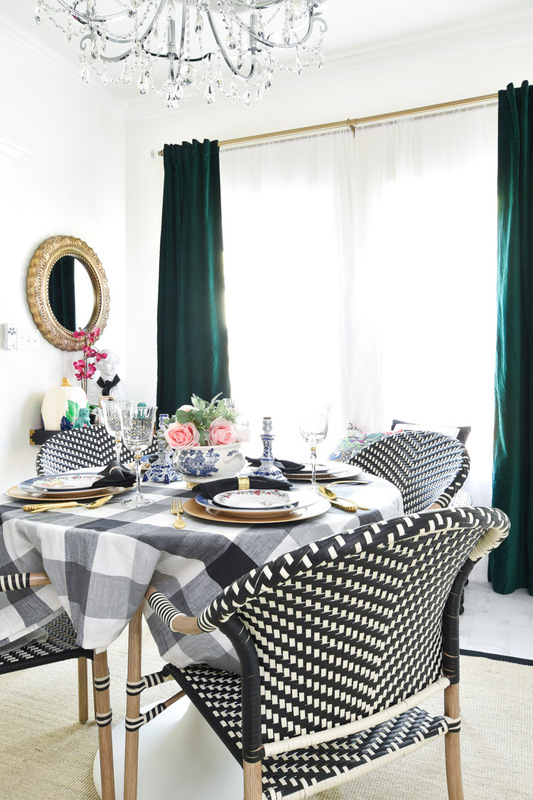 Her style is amazing, and I her home is a feast for the eyes with its bold decor and color. Hi Monica, everything looks beautiful! Where did you buy the living room shelving that has the black drawers at the bottom? I love that piece. Monica I seriously you knocked it out of the park! 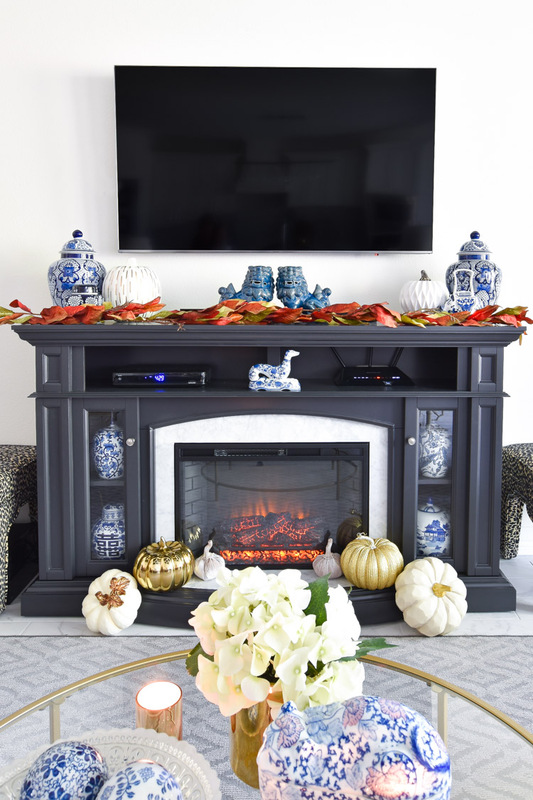 You blended your fall decor and your existing chinoiserie pieces so well. And OMG that table setting, just beautiful! 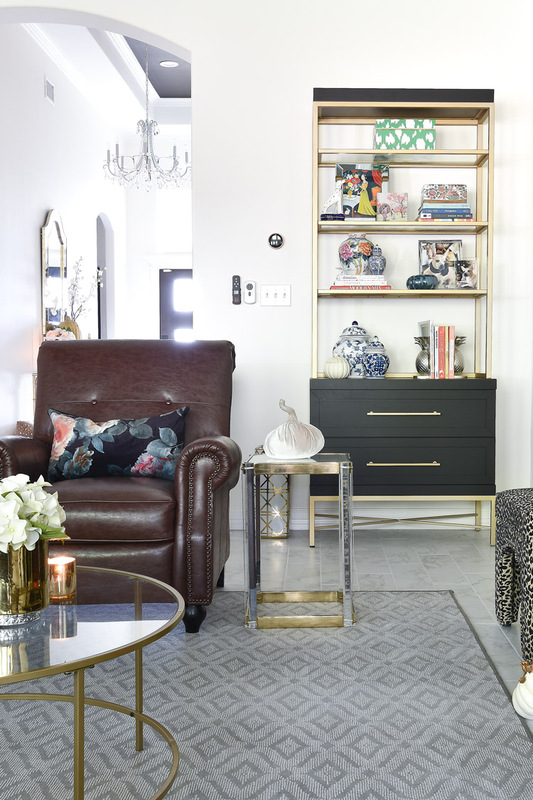 Your entire home is magazine worthy! I'm completely in love with the table and those tobacco leave plates and pumpkins! Wow just wow!!! Everything looks beautiful Monica!! 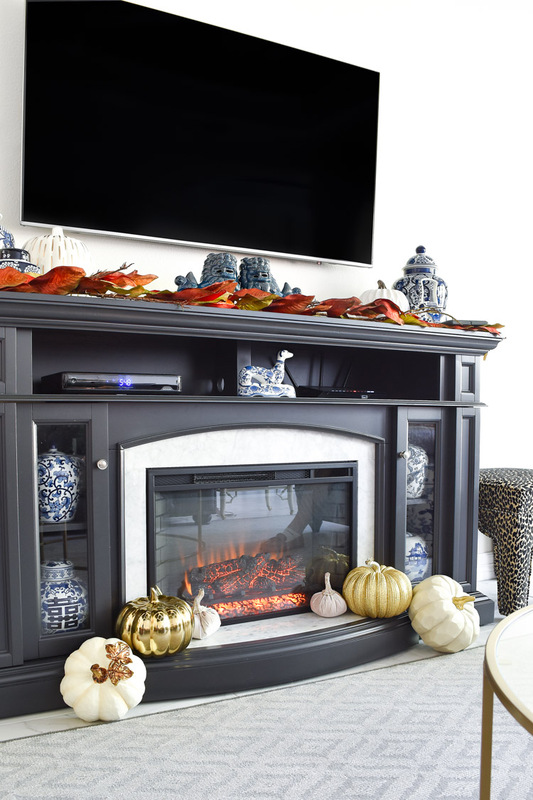 Love how colorful your fall decor is! Hi Monica, I am in love with your leopard ottomans, where did you get them ?? 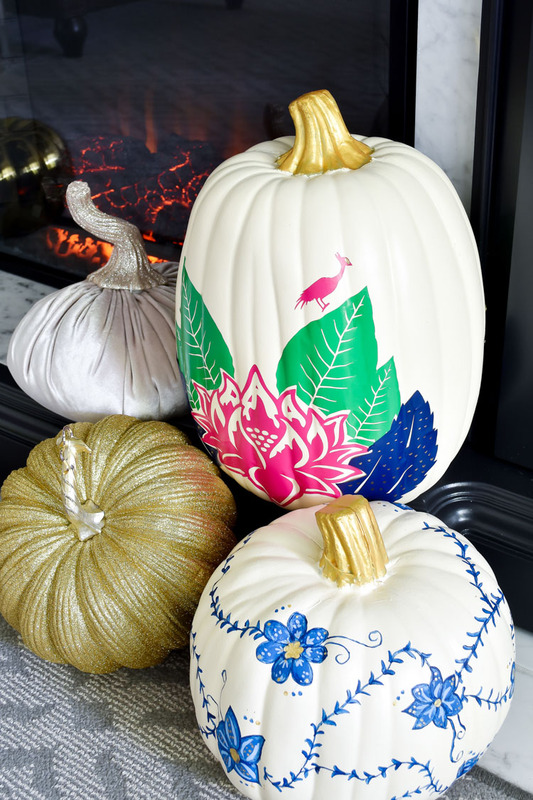 no one does glam pumpkins like you! Enjoy the fall season. Thanks so much, Laura, you too! Such a beautiful tour! 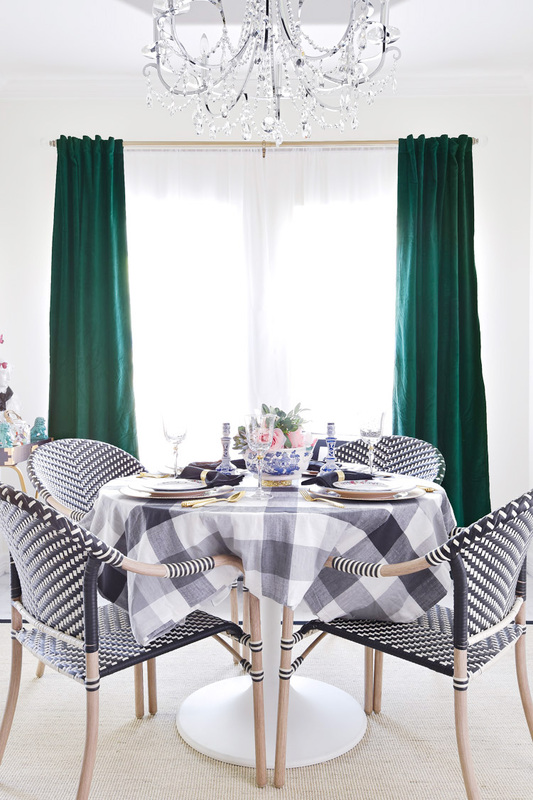 Love those green drapes and the black bow tie napkins! Genius! Happy Fall! Beautiful as always!! I love that PeeWee makes a guest appearance in your photo shoots. My dog, Sage, usually does in mine too! I love the new ottomans, and the fireplace was a steal for $125!! What is there not to love about this space??? absolutely NOTHING!! 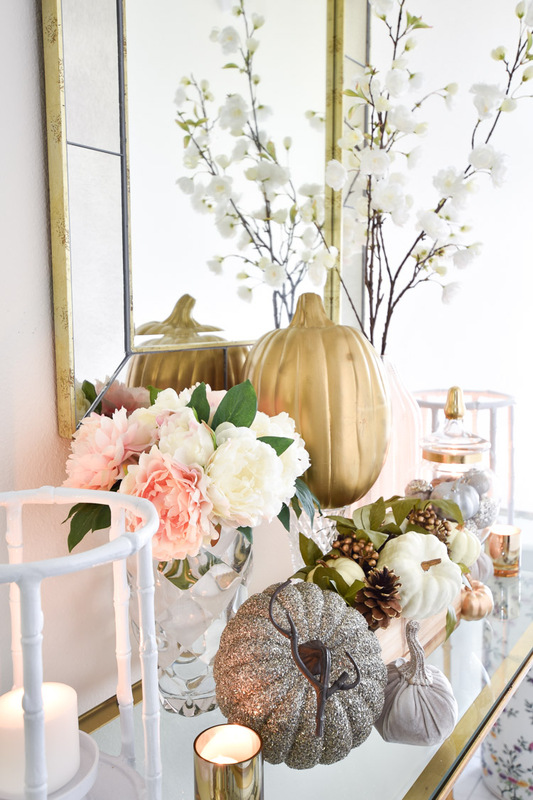 You gave a whole new meaning to having pumpkins around the house.. Each and everyone was styled to perfection. 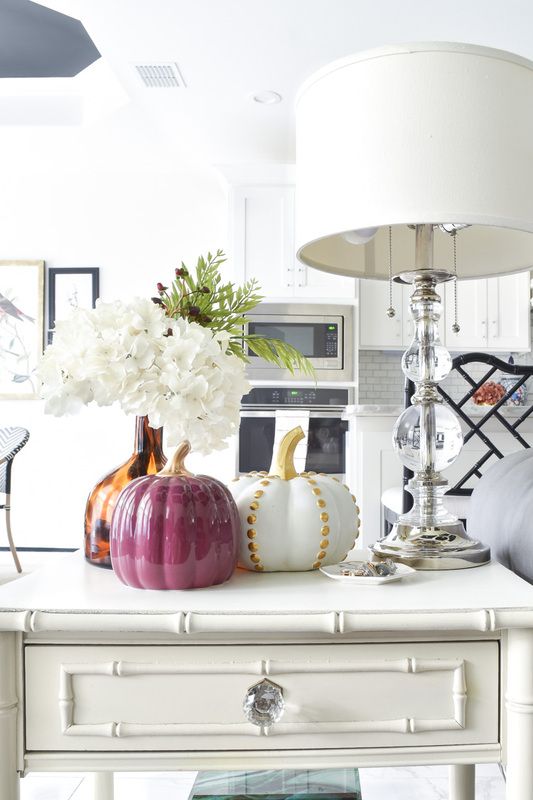 I love all of your home tours, In some of them, its really making me want to add a few pumpkins. Stunning Monica! 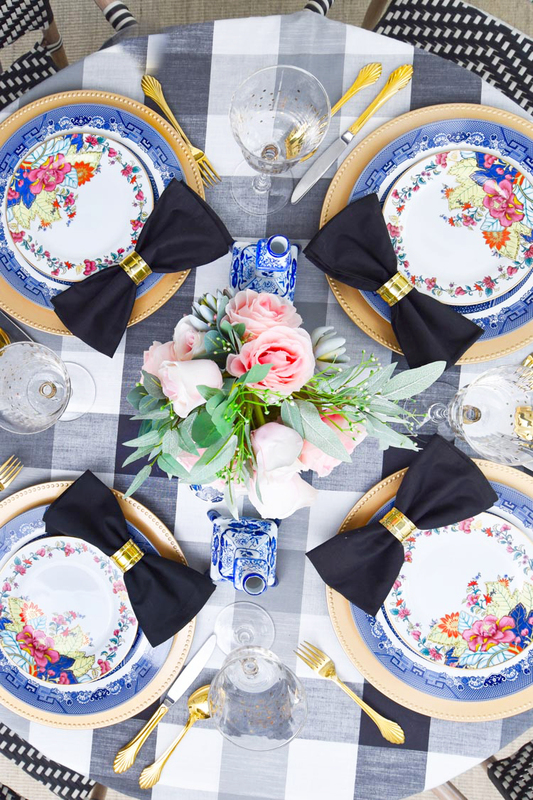 I'm completely obsessed with the stunning mix of colorful plates on your table setting. Such a gorgeous tour. Monica your home is so pretty. The new green velvet curtains are gorgeous!!!! I have been dying for that rich shade lately too. 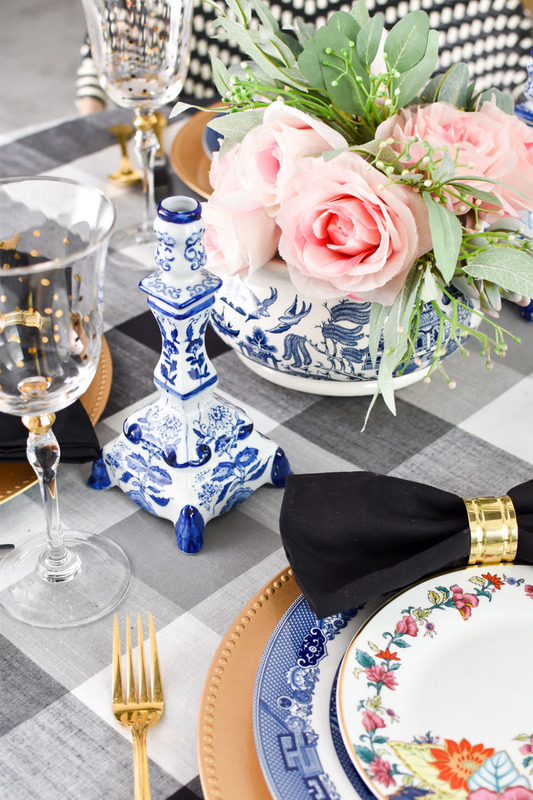 Your tablescape looks amazing – you'll have to have someone over for dinner! Enjoy – it's all beautiful. Thanks, Lisa! You're right, I should totally host a dinner party soon. xo. Thanks, Susie! Glad you love my crazy eclectic decor style. Such a beautiful tour, Monica! 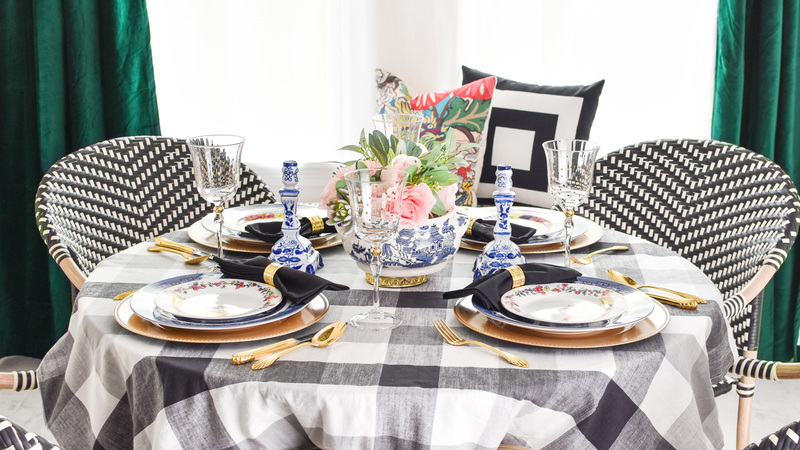 I love the way you mix color and pattern — so gorgeous! I totally have never realized that pillow had a dragon on it. Mind blown! It's not like you live there or anything…. love you, honey. I admire your girly, glam sophisticated style. 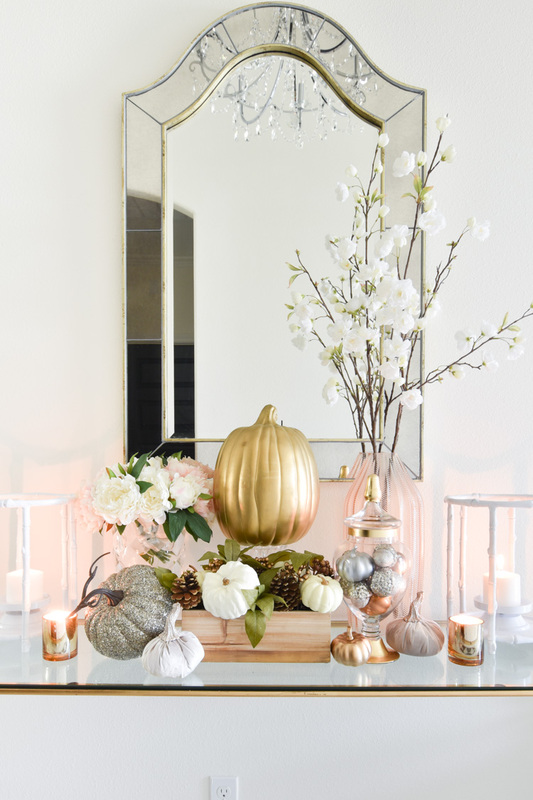 Very inspired to replicate the pumpkin decor on top of the bamboo glass-top table. Thank you! You're welcome, June- happy decorating! As usual, every detail is perfect and well placed! I love your attention to detail, and your use of chinoiserie! Pinned! So beautiful! 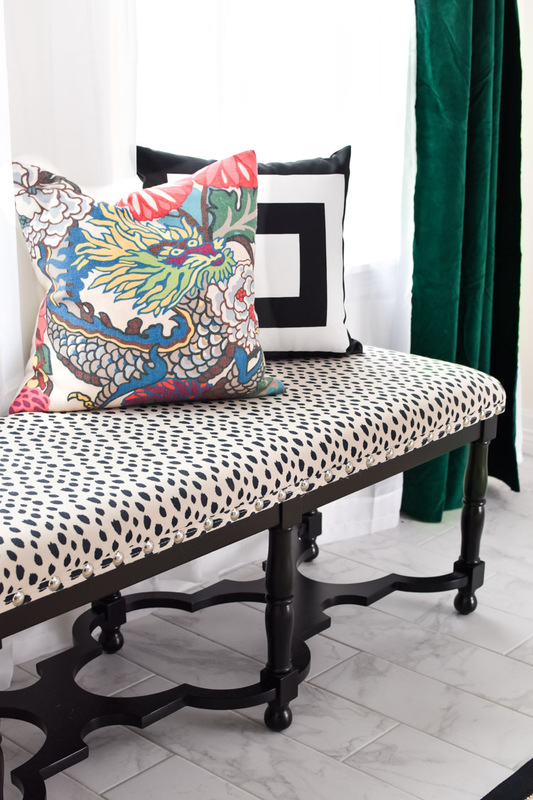 The table is perfection and I love the new leopard ottomans-very versatile! Looking forward to seeing the new drapes when they arrive-same as the dining room, right? Oh my gosh I am speechless!! 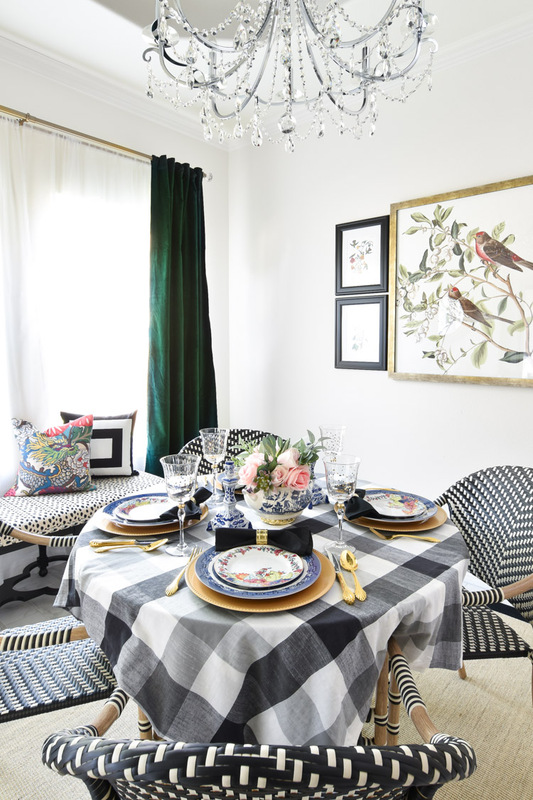 Love everything — your use of color and drama but so light and fresh. 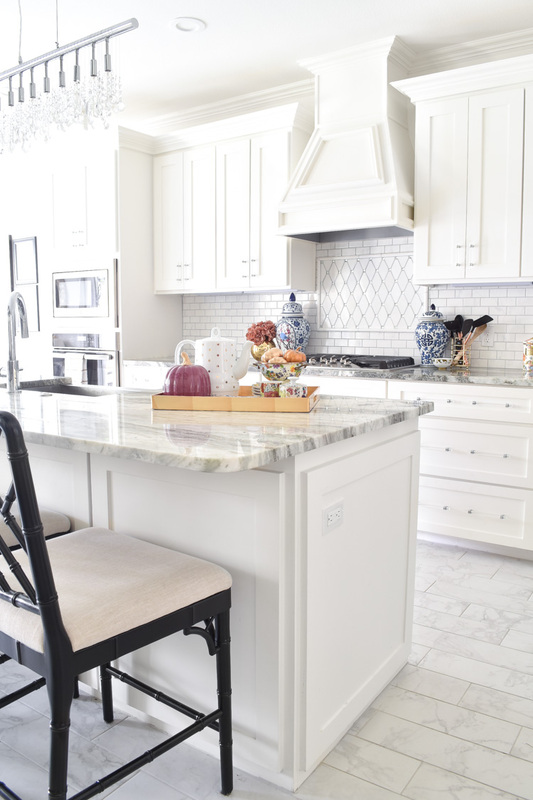 Your kitchen is a dream. So, so gorgeous!! Thank you, Anita! I do love my kitchen. Oh my, so beautiful. I love it all. I really do like the way you create the most interesting vignettes. You add color and pattern so well. Your home is really becoming a showplace. Thanks so much for joining the tour, as usual there is tons of inspiration. Thanks so much, Marty! And thanks again for hosting this fantastic tour.